Well, even as I continue with Logan's Run: The TV Series, I'm now beginning to blog the original Kolchak: The Night Stalker, and figured it would be appropriate to begin my effort all the way back at the beginning; with the original TV movie written by Richard Matheson (based on an unpublished story by Jeff Rice) that aired back in 1971. It was - and for many years after, remained - the highest rated TV movie of a generation. Our journey begins in Las Vegas in the early 1970s, where down-on-his luck reporter Carl Kolchak (Darren McGavin) is working for a rag called the Daily News under the thumb of editor Tony Vincenzo. It seems Kolchak was once one of the great journalists of the day, but he's been fired more times than you can count, and is looking for that one earth-shattering story that will catapult him back to the big time in New York City. He shares these dreams with a local prostitute, Gale Foster (Carol Lynley), but she isn't holding out too much hope. In the latter half of May, however, a series of brutal killings are uncovered in Las Vegas. Four women are found dead, their bodies drained entirely of blood. And oddly, the coroner (Larry Linville) has found saliva in their wounds, indicating that an honest-to-goodness vampire might be the culprit. Kolchak considers this avenue, but runs into a brick wall erected by the stone-walling mayor and Las Vegas's chief law enforcement official, Sheriff Butcher (Claude Akins). They refuse to consider Kolchak's theory, and consequently more citizens die. Finally, once the culprit is named - Janos Skorzeny - the police are unable to stop the 70 year-old man because bullets seem to have no affect on the oddly youthful assailant. Realizing it is up to him, Kolchak locates the vampire's house, rescues Skorzeny's latest victim, and finishes off the vampire with a well-placed stake to the heart. But In order to keep the story quiet, Butcher prepares to charge Kolchak with murder...unless he leaves Las Vegas for good. Kolchak does so, and also learns that Gale Foster has left town, never to be heard from again. Richard Matheson is a genre great, and as such has written some brilliant teleplays, including Duel (1973), too many Twilight Zones to enumerate here and, of course, The Night Stalker. In this project, he provides reporter Carl Kolchak with a real and individual voice, a stirring and interesting first case, and even a sense of humor. McGavin does the rest, playing up the role with a rat-a-tat delivery that is unmatched to this day. He's not your typical protagonist, but rather a persistent little irritant with a nose for news, and gosh, I love him! The story itself, about a vampire on the loose in Las Vegas, remains more interesting for what it doesn't tell you. Rather than spoon feeding audiences the background information, there's plenty here that is just mentioned in passing. For instance, late in the story, Kolchak breaks into Skorzeny's house and finds an open traveler's crate. Inside the trunk, we see Skorzeny's disguises, and even some make-up. There's face paint, wigs, etcetera, and instantly (but importantly, without comment...) we get a sense of the vampire's long history, and his travels from Berlin to London to Canada to the United States (as enumerated in a police press conference.) It's just a nice little touch that acknowledges how a vampire could be immortal, and as a consequence of that life span, well-traveled to boot. I also admire the artistic and efficient way this TV film was lensed (by director John Llewelyn Moxey). The opening shots are hand-held, on-the-spot views of a busy strip in Vegas at night, and the atmosphere is pure seventies, pure sleaze. As a set-up for the first vampire attack (in a dark alley...), it's just perfect how quickly and cogently a sense of atmosphere is mastered with one tool (a shaky cam) and one well-observed location (a crowded street corner.) It's an informative opening shot, and an atmospheric one too. The hand-held feel of the camera makes us feel tense immediately, like we're amongst the street walkers. Finally, I have to say that it has been about six years since I last saw this telefilm, and I was pleasantly surprised to see how well it holds up today. For one thing, the climactic moments of the film are much scarier and much more suspenseful than I remembered. Watching it this time, I noticed how the soundtrack goes almost completely silent during Kolchak's long, tense exploration of Skorzeny's house. No mood music to speak of; very few sound effects, even. The result is that the only sound I could hear during this extended sequence was my own heart beating in anticipation and fear. The sequence must have lasted a good four or five minutes, and when the music and sound effects did finally arrive (as Skorzeny returns home...) the transition from silence simply made the denouement all that more exciting. One of the things that I will always love about Darren McGavin's Kolchak is the fact that we say he's a hero, but he really isn't a traditional, physical hero. As displayed here, Kolchak's great gift is that he speaks truth and common sense to power. That's a wonderful trait. But it's not exactly something that comes in handy while monster hunting. So he's vulnerable in a very sympathy-provoking way. 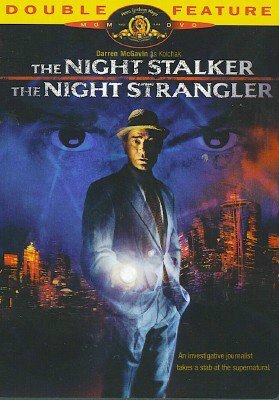 Next up - the second Tele-Movie - The Night Strangler!